This agreement is designed to lease a facility to a professional group of physicians who will operate the premises as a surgical center and clinic. The lease requires the tenant doctors to subordinate the revenues from their practices to their leasehold obligations. 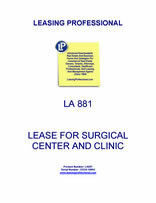 This Lease is made as of _________________, by and between COMMERCIAL PROPERTY LANDLORD, INC., a __________________ corporation ("Landlord"), and AGREEABLE PROFESSIONAL MEDICAL CLINIC., a _________________ professional corporation ("Tenant"). 1.1 BASIC INFORMATION AND DEFINITIONS. In addition to the terms that are defined elsewhere in this Lease, the following terms and phrases shall have the meanings ascribed thereto below in this ARTICLE 1, unless otherwise limited or expanded elsewhere in this Agreement. Any reference in this Agreement to any of the following basic provisions shall be deemed to incorporate all of the pertinent provisions hereinbelow set forth in this ARTICLE 1. K. ANNUAL BASE RENT _____________ Dollars ($__________) as adjusted in accordance with SECTION 3.2. R. USE PERMITTED General office use and as defined in SECTION 8.1. January 1 thereafter occurring within the Term. 1.3.3 AFFILIATE shall mean when used with respect to any corporation, limited liability company, or partnership, any person, corporation, limited liability company, partnership or other legal entity, which, directly or indirectly, controls or is controlled by or is under common control with such corporation, limited liability company, or partnership. For the purposes of this definition, "control" (including the correlative meanings of the terms "controlled by" and "under common control with"), as used with respect to any person, corporation, limited liability company, partnership or other legal entity, shall mean the possession, directly or indirectly, of the power to direct or cause the direction of the management and policies of such person, corporation, limited liability company, partnership or other legal entity, through the ownership of voting securities, partnership interests or other equity interests. 1.3.4 ASSESSMENTS shall mean all levies or charges of every kind and nature for any easement or agreement maintained for the benefit of the Property, association fees, permits, inspection and license fees, general or special assessments, water, sewer or other rents, charges and fees and all other governmental charges of every kind and nature, whether general or special, ordinary or extraordinary, or foreseen or unforeseen, in connection with the Property which at any time may be assessed or imposed on or in respect of or be a lien upon (a) Landlord or its interest in the Property, (b) the Property or any part thereof, any rent therefrom or any interest therein, or (c) any occupancy, use or possession of, sales from, or activity conducted in connection with the Property or any part thereof, including leasing. 1.3.5 BASE RENT shall have the meaning set forth in SECTION 3.1 herein. 1.3.6 BASE RENT ESCALATION shall have the meaning set forth in SECTION 3.2 herein. 1.3.7 CODE shall mean the Internal Revenue Code of 1986, as amended. 1.3.8 COMMENCEMENT DATE shall mean the date set forth in SECTION 1.2 (F). 1.3.9.3 A certificate signed by the Project Architect to the effect that construction of the Suite has been completed in accordance with the Plans, subject to punch list item specified as a result of the due diligence of the Tenant or the Architect. 1.3.10 CPI shall mean the Consumer Price Index published by the Bureau of Labor Statistics of the United States Department of Labor, All Items for Urban Wage Earners and Clerical Workers (1982-84 = 100), or if such index is not available, a comparable index selected by Landlord which is published by a governmental institution or a nationally recognized publisher of statistical information. 1.3.11 CPI INCREASE shall mean on the third Adjustment Date, the amount obtained by multiplying (a) the Base Rent then payable under the Lease immediately preceding the third Adjustment Date, by (b) the percentage increase between the CPI for the month of November immediately preceding the third Adjustment Date and the CPI for the month of immediately preceding the second Adjustment Date. For each next succeeding Adjustment Date, the CPI Increase shall mean the amount obtained by multiplying (a) the Base Rent then payable under the Lease immediately preceding the applicable Adjustment Date, by (b) the percentage increase between the CPI for the month of November immediately preceding the Adjustment Date and the CPI for the month of November for the immediately preceding prior Adjustment Date. The CPI Increase for each Adjustment Year shall be effective as of the first day of such Adjustment Year. 1.3.12 ENVIRONMENTAL CONDITION shall mean the release of a hazardous pollutant or the generation, manufacture, refining, transportation, treatment, storage, handling, disposal, transfer, production or processing of a hazardous pollutant or other dangerous or toxic substance or solid waste in violation of any applicable environmental law. 1.3.13 HAZARDOUS MATERIALS shall mean any substance, including without limitation, asbestos or any asbestos containing materials, the group of organic compounds known as polychlorinated biphenyls, flammable explosives, radioactive materials, infectious wastes, biomedical and medical wastes, pollutants, effluents, contaminants or emissions, regulated under any Hazardous Materials Law. 1.3.14 HAZARDOUS MATERIALS LAW shall mean any local, state or federal law, regulation, ordinance, order, judgment, agreement with a governmental authority or other legal requirement relating to the indoor or outdoor environment, human health or safety, occupational health or safety or industrial hygiene, including, without limitation, the Resource Conservation and Recovery Act of 1976 ("RCRA"), the Comprehensive Environmental Response, Compensation and Liability Act of 1980 ("CERCLA"), as amended by the Superfund Amendments and Reauthorization Act of 1986 ("SARA"), the Hazardous Materials Transportation Act, the Federal Water Pollution Control Act, the Clean Air Act, the Clean Water Act, the Toxic Substances Control Act, the Safe Drinking Water Act, the Occupational, Health and Safety Act ("OSHA") and the _______________ Petroleum Underground Storage Tank Act, all as now or hereafter amended and all similar or related federal, state or local environmental requirements. 1.3.15 LEASE YEAR shall mean a period of twelve (12) full calendar months beginning on the Commencement Date or on each anniversary date thereof, (unless the Commencement Date shall be other than the first day of a calendar month, in which event it shall begin on the first day of the following month). 1.3.16 LENDING INSTITUTION shall mean any insurance company, federally insured commercial or savings bank, national banking association, savings and loan association, employees' welfare, pension or retirement fund or system, corporate profit-sharing or pension trust, college or university, or real estate investment trust, including any corporation qualified to be treated for federal tax purposes as a real estate investment trust, or any Real Estate Mortgage Investment Conduit, Financial Asset Securitization Investment Trust or similar investment vehicles created in connection with commercial mortgage backed securities. 1.3.17 MAJOR ALTERATION(S) shall mean any repair, replacement, restoration, remodeling or rebuilding of the Suite or any portion thereof that is not normal, ordinary or recurring to maintain the Suite. 1.3.18 OFFICER'S CERTIFICATE shall mean a certificate of Tenant signed by the President, Chief Manager, any Vice President or the Treasurer of Tenant or another officer authorized to so sign by the Board of Directors or By-Laws or Operating Agreement of Tenant, or any other person whose power and authority to act has been authorized by delegation in writing by any of the persons holding the foregoing offices. 1.3.19 OVERDUE RATE shall mean on any date, a rate per annum equal to Six Percent (6%) above the Prime Rate, but in no event greater than the maximum rate then permitted under applicable law. 1.3.20 PASS THROUGH EXPENSES shall mean all expenses, costs and disbursements (including Taxes and Assessments) of every kind and nature (determined for the applicable Adjustment Year on an accrual basis in accordance with generally accepted accounting principles) paid or incurred by Landlord or Landlord's beneficiaries in connection with the ownership, management, operation, maintenance, replacement and repair (including capital expenditures and reserves for capital replacements required by the Facility Mortgagee) for the Medical Building and the parcel of real estate on which the Medical Building is located (the "Premises" or the "Property") (including but not limited to parking, driveway, sidewalk, fencing and other portions of the common areas), easements or the personal property and fixtures used in connection therewith, including but not being limited to insurance (fire, extended coverage, rent, business interruption, earthquake, war risk, commercial liability, etc. ); utilities; license, permit and inspection fees; cost of funds imposed by Facility Mortgagee on the Landlord (other than costs resulting solely from a variable interest rate, janitorial costs; wages and salaries of operating personnel, including, among others, maids, janitors, and security guards; repairs and maintenance to the Medical Building and the Premises; and security services. 1.3.21 PAYMENT DUE DATE shall mean any due date for the payment of the installments of Base Rent and Additional Rent or any other sums payable under this Lease. 1.3.22 PERSON shall mean and include an individual, corporation, limited liability company, partnership, trust, unincorporated association, government, governmental authority, and any other entity. 1.3.23 PHYSICIAN SUBORDINATION, NON-COMPETE AND GUARANTY AGREEMENT shall mean the agreement substantially in the form of EXHIBIT A attached hereto with respect to each physician/member of Tenant requiring such physician/member to (a) subordinate his/her income, fees and distributions from Tenant to the payment and performance of the obligations of the Tenant set forth in this Lease; (b) refrain from competition with the Tenant within a limited period of time and geographic area as set forth in the Physician Subordination, Non-Compete and Guaranty Agreement; and (c) guarantee (on a limited basis) the payment and performance of the obligations of the Tenant as set forth in the Physician Subordination, Non-Compete and Guaranty Agreement. 1.3.24 PRIME RATE shall mean the annual rate announced by _______ Bank (Lender Bank) to be its prime rate for 90-day unsecured loans to its United States corporate borrowers of the highest credit standing, as in effect from time to time. 1.3.25 PROPERTY shall mean the real property attached hereto as EXHIBIT B, together with all improvements, covenants, licenses, privileges and appurtenances thereto belonging (including, without limitation, any easements, rights-of-way, rights of ingress or egress or other interests in, on or to any land, highway, street, road or avenue in, on, across, abutting or adjoining such real property and any strips and gores adjacent to or lying between such real property and any adjacent real property). 1.3.26 QUALIFIED MEDICAL PROVIDERS shall mean a physician or other health care professional that is duly licensed in the State of _______________ and fully qualified to render the medical services in the specialty rendered by such provider in the Suite. 1.3.27 RATING AGENCIES shall mean Standard & Poors Rating Group ("S&P"), Moody's Investors Service Inc. ("Moody's"), Fitch IBCA, Inc. ("Fitch"), Duff & Phelps Credit Rating Co. ("Duff & Phelps"), or any of their respective successors, or any other nationally recognized credit rating agency or agencies which is rating securities issued in connection with any securitizations or other secondary market transaction in which the loan secured by the Facility Mortgage is included. 1.3.28 RELEASE shall mean releasing, placing, spilling, leaking, pumping, pouring, emitting, emptying, discharging, injecting, escaping, leeching, disposing or dumping, whether intentional or unintentional. 1.3.29 SECURITY AGREEMENT shall mean that certain Security Agreement to be dated on or about the Commencement Date or executed upon the request of the Landlord pursuant to the terms of which Tenant has granted to Landlord a first priority security interest in all of Tenant's Collateral, including, without limitation, Tenant's Personal Property, to secure (a) Tenant's obligations under this Lease, (b) Tenant's and the Physicians' obligations under the Physician Subordination, Non-Compete, Guaranty and Indemnification Agreement; (c) any and all other obligations of Tenant or any Affiliate of Tenant or to Landlord and which is assignable to any Facility Mortgagee. 1.3.30 TAXES shall mean all federal, state and local governmental taxes, assessments and charges (including general real estate taxes, and transit or transit district taxes or assessments) of every kind or nature, which Landlord shall pay or become obligated to pay because of or in connection with the ownership, leasing, management, control or operation of the Suite (including the Premises on which it is situated), or of the personal property, fixtures, machinery, equipment, systems or apparatus located therein or used in connection therewith (including any rental or similar taxes and license, building, occupancy, permit or similar fees levied in lieu of or in addition to general real or personal property taxes) or any limited liability company assessments. For purposes hereof, Taxes for any year shall be Taxes, which are due for payment or paid in that year rather than Taxes which are assessed or become a lien during such year. There shall be included in Taxes for any year the amount of all fees, costs and expenses (including reasonable attorneys' fees) paid by Landlord during such year in seeking or obtaining any refund or reduction of Taxes. If a change occurs in the method of taxation resulting in whole or in part in the substitution for any Taxes as above defined (or any other such tax or assessment that are to be paid by Tenant), such substituted taxes or assessments shall be included in Taxes. Taxes in any year shall be reduced by the net amount of any tax refund received by Landlord during such year. Taxes shall not include any federal, state or local sales, use, franchise, capital stock, inheritance, general income, gift or estate taxes. 1.3.31 TENANT'S CONSTITUENT PARTIES shall mean Tenant and each of Tenant's officers, directors, and chief manager. 1.3.32 TENANT'S PROPORTIONATE SHARE shall mean the percentage set forth in SECTION 1.2 (N) of this Lease. 1.3.33 TENANT'S PROPORTIONATE SHARE OF PASS THROUGH EXPENSES shall mean the product of the sum of Pass Through Expenses multiplied by Tenant's Proportionate Share for each Adjustment Year. 1.3.34 UNAVOIDABLE DELAYS shall mean Delays due to acts of God, acts of a public enemy, fires, floods, wars, civil disturbances, sabotage, accidents, insurrections, blockades, embargoes, storms, severe weather, explosions, damage to its plants, labor disputes (whether or not the employees' demands are reasonable and within the party's power to satisfy), government restrictions or regulations, acts of any governmental body (whether civil or military, foreign or domestic), all perils of the seas and other waters, failure or delay of third parties or governmental bodies from whom a party is obtaining or must obtain rights of way, easements, franchises, permits, machinery, materials, equipment, transportation, independent contractor's services or supplies to grant or deliver the same, or inability to obtain labor, services, materials, equipment or transportation or other causes beyond the control of the party responsible for performing an obligation hereunder (individually and collectively, "Force Majeure"). 1.3.35 UNSUITABLE FOR ITS PRIMARY INTENDED USE shall mean, as used anywhere in this Lease, that, by reason of damage or destruction, or a Partial Taking, in the good faith judgment of Landlord, reasonably exercised, the Suite cannot be operated on a commercially practicable basis for its Primary Intended Use, taking into account, all relevant factors, and the effect of such damage or destruction or Partial Taking. Except as otherwise expressly provided or unless the context otherwise requires, (a) the terms defined above include the plural as well as the singular, (b) all accounting terms not otherwise defined herein have the meanings assigned to them in accordance with generally accepted accounting principles as at the time applicable, (c) all references in this Lease to designated "Articles", "Sections" and other subdivisions are to the designated Articles, Sections and other subdivisions of this Lease, and (d) the words "herein", "hereof" and "hereunder" and other words of similar import refer to this Lease as a whole and not to any particular Article or Section.